Even though in 2015 IronFX was placed on the blacklists of several online trading review portals, for mishandling the funds deposited by its clients, the operation has since rebuilt its brand reputation. The IronFX of nowadays is not the same brokerage it was a little over two years ago. It has secured sponsorship deals with some of the world’s best-known and most respected sports organizations, like FC Barcelona and it has sponsored high-profile sports events such as the ORC Worlds Trieste 2017. 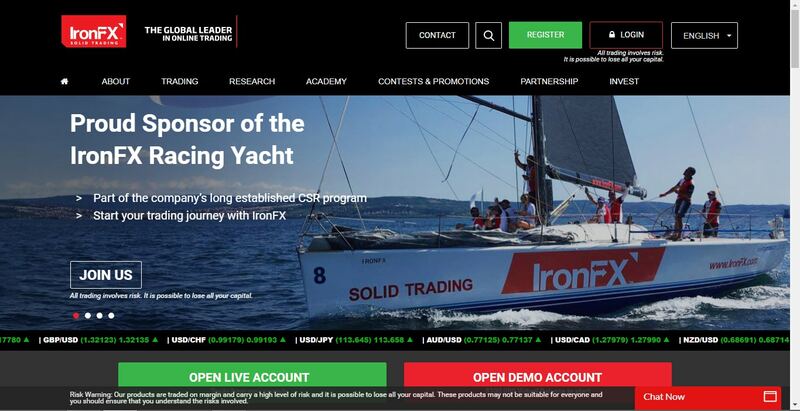 The operation is very active on the sponsorship scene and it has secured the services of a tied agent in RDP Limited – another Cyprus-based firm, which has taken upon itself to solely promote the financial services offered by IronFX. While all the above is nice and dandy, it obviously means very little without a sturdy regulatory background for the operator. Fortunately, IronFX have whipped themselves into shape in this regard as well. They have been licensed by CySEC since their launch in 2010. In fact, the agency was instrumental in straightening out the above mentioned customer fund problems. IronFX’s CySEC license number is 125/10. This license makes the operation MiFID compliant, which means that it is indeed free to offer investment and ancillary services all over the European Economic Area (EEA). Despite that, the operation was registered with a number of national regulators, such as France’s BaFIN and Italy’s CONSOB. In addition to all the above, IronFX can offer regulated services in the UK and Australia too. In these countries, the brokerage is represented by subsidiaries, who are licensed by the FCA and ASIC respectively. In the UK, the company representing the IronFX brand is 8Safe UK Ltd. It is licensed by the FCA, under number 585561. In Australia, IronFX’s local “branch” is called GVS Pty Ltd, and it is licensed by ASIC, under number 417482. When it comes to trading platforms, IronFX have really done their homework. The centerpiece of their platform offer is obviously the battle-tested and proven MT4, which is indeed the gold standard in regards to trading tools, charting solutions and various technical indicators. IronFX have taken the basic version of the platform though and ran with it. Their MT4 is available in no fewer than 12 different versions, covering PC, mobile, Mac and tablet-based users. For the PC, it is available in Standard, Advanced and Multi-Terminal versions. The mobile trading platforms are obviously a little simpler, but they do deliver the bulk of the MT4 functionality nonetheless. Perhaps even more interesting than MT4, is IronFX’s own, in-house creation, the Webtrader 4. This platform complements the capabilities of MT4 wonderfully. Built on HTML5 technology, it can be accessed from anywhere download-free, and it gives traders the chance to connect to their MT4 accounts through it. Needless to say, Webtrader 4 is fully synchronized with all the downloadable MT4 versions. The web terminal uses cutting-edge encryption, to make sure that all the data transmitted through it is 100% secured. Its compatibility with most of the modern browsers is simply amazing. The Personal Multi Account Manager (PMAM) platform is a superb addition for money managers who need to juggle several MT4 accounts. Like MT4, it can be downloaded directly from the IronFX website, and it comes with a handy user guide. It allows the creation of multiple funds and the management of an unlimited number of MT4 accounts. It works with Microsoft Windows and it requires a version higher than 98 (which should absolutely not be a problem for anyone). In this operational area, IronFX truly excel. They feature no fewer than 8 account types for various retail investor-categories. The Micro Account is the most basic, requiring a minimum deposit of only $100. No fewer than 10 currencies are supported by the account, which still offers “industry best” spreads and the possibility to trade micro lots. Micro account users can choose from fixed and variable spreads and they can enlist the services of a dedicated account manager. The Premium Account is just as easy to register for as the Micro one. The minimum required deposit for this one is $2,500 though. Otherwise, its feature are the same as those of the Micro account, though its spreads and margin requirements may be slightly more attractive. The VIP account is available in USD only, and it requires a deposit of at least $20,000. It allows for the trading of mini lots and its spreads/margin requirements are better still. The Absolute Zero account is a STP/ECN account, which offers spreads from 0.0 pips. The leverage is flexible on this account, meaning that traders can tweak it from 1:1 all the way to 1:200. Micro lots can be traded with this account. The STP/ECN Accounts section allows traders to choose between STP Zero Spread and No Commission accounts. The minimum deposit required by this one is $500. The Zero Fixed Spread account also calls for a $500 deposit, and it offers a special leverage on Metals, which is 1/5th of the account leverage. On a 1:500 account leverage for instance, the Metals leverage is 1:100. The Mirror Account boasts a Lower Risk, Total Return strategy (which is a bit fishy if you ask us) with instant internal transfers and lower stop-out levels. The Absolute Zero Plus account is again about spreads starting from 0.0 pips. It comes with a maximum IB commission of $10. Institutional traders have 4 account types at their disposal. With the Affiliate Account, spreads start from 0.9 pips. This account option gives traders access to all the instruments available at IronFX, while allowing them to work with their preferred introducing broker. The Affiliate Plus Account offers rather similar features. It is only available to clients brought into the IronFX fold by special Introducers. The Business Account comes with 3 tiers of its own: Corporate, Institutional and Trust. Managed Accounts are managed by special Money Managers. To learn more about the details of the services offered by these money managers, institutional investors are required to contact IronFX. In one shape or another, IronFX offer more than 200 tradable assets. This selection covers Forex (120 currency pairs), Spot Metals, Spot Indices, Spot Commodities, Futures and Shares. The most intriguing of all the assets on offer is bitcoin, from the Spot Commodities section, which can indeed be traded as a commodity. It has to be noted though that the spreads are massive on BTC and the Margin Requirement isn’t particularly attractive either. IronFX offers Excess of loss insurance cover over and above the FSCS limit of £50,000. Protection up to £1,000,000 per client. Applicable only to FCA clients. IronFX support can be reached through live chat and a plethora of phone numbers, one for each of their 4 offices. The official support email is [email protected] The site also offers a callback feature. IronFX looks like a serious and safe destination for retail- as well as institutional investors. Though its shady past is not forgotten, its offer these days seems to pass the scrutiny of the trading community. Regulated and licensed, the operation offers a generous platform selection. Their account-type selection is second to none too, and some of their spreads are indeed highly competitive.